The Ultimate ‘Go Anywhere’ Amphibious Craft - Arktos Developments Ltd. There are many vehicles and craft that claim to have ‘go anywhere capability’ but none can get close to the performance offered by an ARKTOS Craft.These unique Craft, which are designed and manufactured by ARKTOS Developments Ltd. (ADL) of Surrey, BC, Canada, have the highest level of all-round amphibious mobility in the world. Due to their unique design ARKTOS Craft have an unsurpassed ability to climb from water to ice and maneuver through ice-rubble fields, significant side slopes, steep grades, muskeg, quicksand and any other water transition zones. The original concept was to develop a craft that could evacuate personnel from offshore oil production facilities in temperatures down to -50°C (-122°F) in mixed water/ice conditions, land-fast ice-rubble fields, shear-zone ice and high winds on any ice surface of the Beaufort Sea. Evacuation is still one of the primary roles for the ARKTOS Craft but today their duties have been extended to include fire fighting, geophysical survey work and exploration in any corner of the world irrespective of the prevailing climatic condition or the terrain. The ARKTOS Craft concept continues to be improved and enhanced and today the mission profile of the current evacuation model includes evacuee survival in the H2 S gas clouds and burning oil slicks that might be encountered during the evacuation of bottom founded oil rigs plus the ability to remain afloat after damaging the integrity of either of the hulls in ice infested waters. 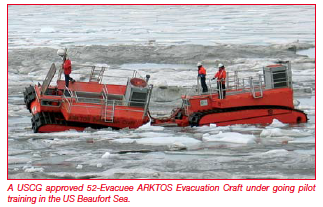 Successful tests of these enhancements, amongst others, were required by the United States Coast Guard (USCG) to approve the 15.24 meter (50 ft.) ARKTOS Craft for evacuation of 52 people from bottom founded offshore islands. Although the existing 15.24 meter (50 ft.), USCG approved, ARKTOS Evacuation Craft can carry 52 evacuees or 5,000 kilograms (11,000 lb.) of cargo through the most severe terrain and up to 10,000 kilograms (22,000 lb.) of cargo in open water, larger versions with a capacity of up to 150 evacuees are being developed. Amphibious ARKTOS Crane Craft and Amphibious ARKTOS Tugs ( to tow Hover Barges) are also on the ‘drawing board’. The ARKTOS Craft comprises a permanently linked pair of sandwich composite hulls or units as they are called. Each hull is independently powered by its own diesel engine. On ice or land motive power is provided by the tracks, while in water, propulsion jets supply the required thrust. A hydraulically powered articulation arm links the two hulls, or units. Articulation control is achieved by logic circuits operated through a joystick allowing each unit to operate at independent angles with three axis of motion. This gives ARKTOS Craft exceptional mobility while moving across the interface between dissimilar footings such as the transition from water to ice, land to ice, land to water, muskeg, and land to quicksand. 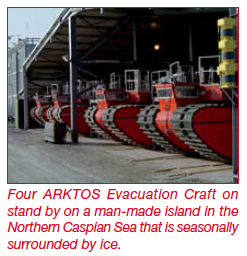 The articulation arm also allows ARKTOS Four ARKTOS Evacuation Craft on stand by on a man-made island in the Northern Caspian Sea that is seasonally surrounded by ice. Craft to negotiate the irregular terrain in ice-rubble fields, ice ridges, abrupt drop-offs, side slopes and most other hostile terrain. The DIAB Technical Services team has recently been heavily involved in assisting ADL to reduce the weight and increase the strength of the hulls, decks, structural- bulkheads, drive-wheel boxes, nose idler-wheel boxes and water-tight hatches, etc. particularly in terms of the crushing and abrasive forces that can be exerted when an AR KTOS Craft is traversing ice floe formations. This has involved re-engineering the laminates (which now comprise a combination of E-glass and Kevlar fabrics over a DIAB sandwich core) and introducing DIAB Core Infusion Technology™. As a result of the new laminate specification, ADL has removed the original steel reinforcements without any loss of structural integrity. DIAB Tech Services also carried out a series of flow modelling exercises to determine the ideal infusion set-up and was then on site to assist the ADL production team with the set-up and infusion of the first hull, deck and structural bulkhead moldings.